Add a new amenity to your pet-friendly recreational facility. All Paws Pet Wash offers a self-service, freestanding pet-wash vending station for pets large and small. Perfect for all types of recreational applications, these pet wash vending stations are fully assembled and delivered to your site, ready to connect to your utilities. An All Paws Pet Wash is sure to create a tail-waggin' good time. Poo Free Parks® has expanded its program to Highlands Ranch with installation of nearly 200 eco-friendly dog waste stations, making this the ninth community in the Denver Metro Area to join the program. The Poo Free Parks® program makes biodegradable dog waste bags available to residents using area parks, open spaces and trails—committed to keeping outdoor spaces clean and enjoyable for visitors and pets. At the same time, the program reduces the fiscal burden on local municipalities with program funding provided by sponsors that are publically recognized for their support. 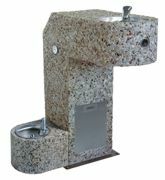 The pedestal pet/people drinking fountain, shown here, is available in various precast aggregate colors and finishes. Other finishes include powder-coated metal in 10 colors and stainless steel. Standard features include heavy-duty, vandal-resistant bubblers and self-closing adjustable valves. Many options are available in order to customize the fountain to meet your specific needs. Where there's a wall there's a way to provide a refreshing drink of water for your pup. The model 300 WM (wall mount) is now available for your pet park when your water supply is in a building. This pet fountain is available in your choice of 16 colors and will enhance any pet park. Dogipot introduced the Aluminum Dogipot Header Pak Junior Bag Dispenser to hold Dogipot's new line of Oxo-Biodegradable Dogipot Header Pak Litter Pick Up Bags (i.e., hanging litter pick-up bags). These new items give customers more choice, and the Header Pak bags will fit all major brands of hanging bag dispensers. Dogipot offers high-quality, environmentally conscious products to help keep your dog-friendly areas free from unsightly, smelly and harmful dog waste. Build a community destination that offers dogs and their owners a secure environment to play. Based on popular agility obstacles, BarkPark equipment is designed for dogs of all sizes, abilities and confidence levels. Its proprietary CanineCoat™ provides superior slip-resistant traction, UV protection and resistance to vandalism and urine. This durable composition makes BarkPark a great choice for heavy-use outdoor park setting. Select a prepackaged course or customize your space. Whether starting from scratch or putting the final touches on your off-leash area, Dog-ON-It-Parks is your source for pet-friendly solutions. With a staff of dog park experts, Dog-ON-It-Parks' products are designed to be safe, extremely durable and fun. With a wide selection of dog park agility components, pet fountains, site furnishings and more, plus resources to help you along the way, there's no reason to look anywhere else for your dog park needs. The Doggie Walk Bags dispenser has been a company cornerstone for more than two decades. The classic blue, baby powder-scented bags are highly visible and conveniently pop out one at a time. The durable, rotationally molded plastic dispenser is manufactured in Southern California, and comes in a variety of both stock and custom colors. It can be shipped with hardware, trash bins and signs, as needed.